The door on Noah’s Ark did not close until after man closed his mind! As explained in previous article, we’re now sharing the weekly lessons of “Fellowship of the White Path” on this site. We welcome one and all. Welcome to something different. Please leave a comment if this site is of value to you. After I left what I call the “modern American church system”, I entered a spiritual twilight zone in which most of my former Christian brothers and sisters think I have gone off the deep end, and probably in sin. But have any of them read the material of this site, in which the details of this journey are given? “NO.” It’s as if they are afraid to. I have mentioned to them about discovering important information in early church history and church fathers. (A subject I would think of great interest.) Have they asked me to share what I found with them? “NO.” They seem to have no interest, curiosity, or concern. They seem to be confident in what their own church has taught them, and do not consider this modern materialistic church might be misleading them in any major way. In other words, (for whatever reason), they have closed their minds to other possibilities, and believe having an “open mind” is a spiritual danger. They believe it is a fool’s path putting at risk your very soul to be open minded. To this I have a couple of very simplistic and logical questions. Since when does “greater light” have anything to fear from “lesser light”? Also… who were the Jews who failed to recognize God in Christ, and who were the ones who succeeded in recognizing God was with them, the day of their visitation? Was it not the “close-minded” who failed to see Him? Was it not the “open-minded” who succeeded in hearing Him? If so, how can being open minded be a sin? And how can being closed minded be wisdom? Was not Saul closed minded until Jesus knocked him from his prideful horse of being right, and opened his mind? At which time God then changed his name to Paul. The closed minded Saul now gone, God gave us the “Apostle” Paul. True churches needed to be birthed. In the days of Noah, he preached to those people something like 120 years! And other than his immediate family, not one convert! They were closed minded to any threat of something called a flood, and a God ready to judge! They had closed the door of their mind long before God ever closed the door of the Ark, and yet when the flood waters finally came, they screamed and scratched at that door, wanting in, as if God should open it? Jesus compared the last days to the days of Noah, and sometimes I think I know how Noah felt. If you like the Marvel movies of Ironman, you know he escaped terrorist captivity when he barely managed to construct a primitive iron suit with enough juice to last 15 minutes. That’s all he had. If he had not overcome the enemy and escaped within 15 minutes, he would have died at the enemy’s hand, or continued captivity. I’m sure he wished he had more charge! A man died giving him this one chance. Tony did not waste this man’s sacrifice, but he changed. He repented of who he had been and truly changed. His world had been rocked. A reality check demanding a change. That’s what we’re afraid of, that we might be forced to look at our need of change, and we do not want to change and be like Christ, to live as a Priest! Later in the movie, he has his new and much improved suit of armor, but a bad guy managed to steal the powerhouse unit for the suit, and he had to go back to a previous power unit of lesser power and not fully charged. As this warrior heads out to do battle, one of the first things he checks is the “charge level” on this power unit, and finds it to be at 48%. Notice how important knowing the charge level is. Don’t you know Tony is wishing it were at 100%? Don’t you know he wishes he was still the one being powered by the more advanced unit? Is it any different with us? But do we live our life faithful to such spiritual understanding as God’s Word has revealed? We need to understand our level of CHARGE is connected to the practice of our PRIESTHOOD! Are we the spiritual warrior in Christ? Who has caused them to become a Kingdom of priest? Jesus. Certainly not me. I’m just the messenger, a Noah, pointing this out. I’m a crazy man building a big boat in the desert. A huge boat for so few people? What a waste.) Who are the ones who have become these priest? All born-again in Christ, the children of God. Do you believe yourself such? Are you living it? What kind of boat are you building? Do you regret making the choice to be a child of God? Do you understand the value of priesthood in Christ? Would we neglect such a thing? I know…hard things for us to think about when we’re use to someone tickling our ears with happy-thoughts. But what is going to shake you out of your spiritual neglect and apathy? Happy thoughts? Or God’s simple truth? I’m a man accused of being spiritually off-track, but when you sit in your church building and the preacher is preaching, is he growing you in the powers of your priesthood, or teaching you to reign? Where is the emphasis? The Apostle Paul accused one church of reigning without him. He scolded them for their foolish thinking. The one I follow said he who is servant of all, is greatest. The seed that falls to the ground and dies, bears much fruit. Sacrifice is all about priesthood, but we would live as kings? Noah preached faithfully out of a heart of love and concern to “closed minds” who never entered in. So what are we willing to do about it? Will we begin to take up our cross, our priesthood, put a priority on the Kingdom of God, and come before the Holy of Holies faithfully? Will we watch and pray, or rush out naked into another day? A teacher can only teach. He cannot change a person. Only you can change. Noah could only preach and build the boat, he was not to force anyone in. Is Fellowship of the White Path one of God’s arks in this day? I think we can only be judged by what we teach, and our actions. Are our words true? Are you concerned enough to thoroughly study our words against your Bible before deciding? I absolutely love for people to check the words of this teaching, but I suspect they know the words are true without even doing so. That’s alright too, as long as we take it to heart. We have such opportunity in this day to make a difference, but only if God empowers. Jason took our Fellowship to a Garden Center and Flower shop 2 hour drive away yesterday. He is related to the owners of the business. We had a good time. We ate out on the way and shared that table. But something we did not expect happened at the Flower shop while we were there. One of the employees has a 91 year old dad in the hospital passing away at this very time. We ended up in in a circle prayer of 4, holding hands, and I was asked to pray for this one crossing over. What an honor. And it happened in this place, among other doors that also began to open as we shared. I am amazed how much God has our Fellowship “go out” to others at their tables, not ours. He seems more concerned about we who claim to be followers of Christ going out, than others coming in. I get strange looks when I tell people how our Fellowship works, and yet God keeps sending us places, and a School in the Wilderness is still being slowly developed. So it’s not about numbers, it’s about discipleship. 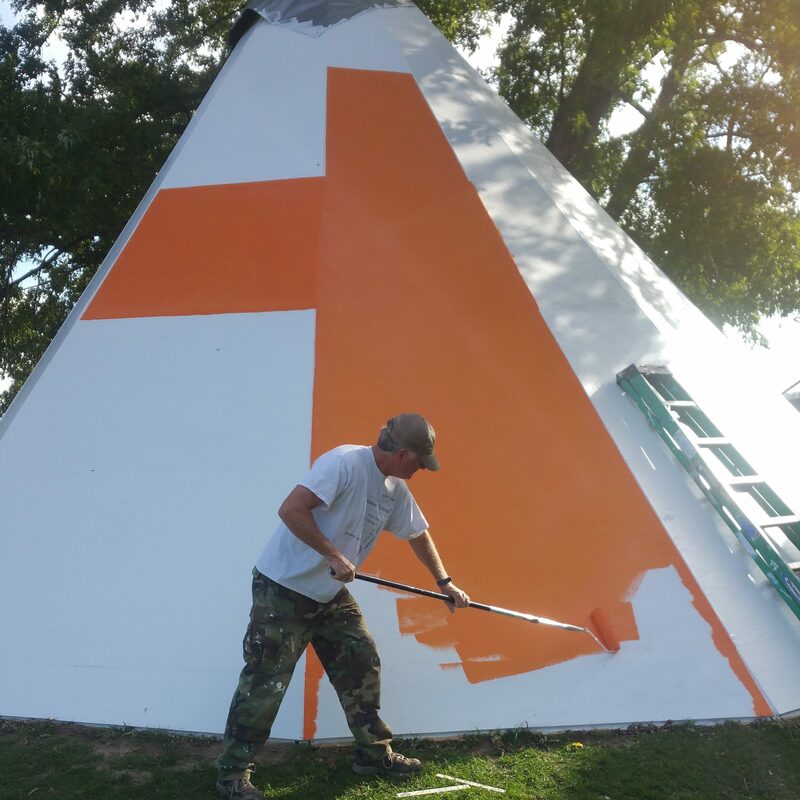 The Teepee may never see any real numbers, but in many ways, including this blog site, God is getting His true message out there. It’s about Priesthood, not Kingship. Are you charged? I bet your cell phone is. It’s not about “going to church”. It’s about “being the church”. Which are you? Do you “go to church”, or “do you live church”? Those who live church walk around in a bright Armor of Light easily seen by one and all. So says Grandpa White Feather. Check if my words be true. Wolves speak with forked tongue. Previous postAre you “STRONG” in the Lord?